BEIJING - The illegal cultivation of poppies in the neighboring country of Myanmar has doubled during the past three years and is presenting a growing problem for those protecting China's borders, said a senior police officer from Southwest China's Yunnan province. Meng Sutie, director of Yunnan's public security department, told China Daily in an exclusive interview that those cultivating the poppies and producing opium try to smuggle most of their drugs across the border. But Meng said the quantity of synthetic drugs being brought into China from Myanmar now exceeds the volume of traditional drugs such as heroin and opium. "Myanmar now grows about 26,800 hectares of poppies," Meng told China Daily from the sidelines of the plenary session of the National People's Congress this week. The deputy said the estimations were based on information collected by both countries during their long-term efforts to monitor the situation with satellite remote-sensing technology and through on-the-ground research in northern Myanmar. However, Meng put the recent growth in the size of the poppy harvest into context, pointing out that a joint campaign by both countries saw the area of poppy fields fall from 201,000 hectares in the 1990s to about 13,400 hectares in 2007. Yunnan province shares a 4,061-km border with Myanmar, Laos and Vietnam. The three neighboring countries, as well as Thailand, comprise the so-called "golden triangle" of poppy cultivation. Because of the long border and proximity to poppy-growing areas, Chinese police arrest more than 10,000 drug traffickers each year. Traffickers from Myanmar are said to be major drug suppliers to Yunnan and are thought to be responsible for 80 to 90 percent of the drugs that are brought in to the province, Meng said. He noted that during the past five years of Sino-Myanmar cooperation, efforts to fight the smuggling of poppy-derived drugs have largely been successful. The total amount of opium and heroin that Yunnan police intercepts annually plunged from the 6 to 8 tons five years ago to 2 to 3 tons currently, he said. "In the past, there were cases involving the trafficking of 500 kg of traditional drugs, tens of cases involving traditional drugs weighing more than 100 kg," Meng said. "However, such big cases have been very rare in recent years." Many of the farmers have been persuaded to plant agricultural products including wheat. However, Meng warned that synthetic drugs were "breaking in with tremendous force". 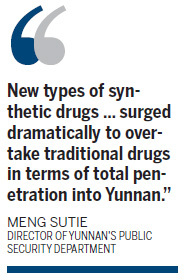 "New types of synthetic drugs such as methamphetamine and ecstasy surged dramatically to overtake traditional drugs in terms of total penetration into Yunnan," he said. Police and armed police at one time would seize a few hundred kilograms of synthetic drugs a year but, in 2010, they netted more than 4 tons. He said the new drugs can be easily synthesized in shabby labs using ingredients that include generic medicines. According to Wang Hailiang, Party chief of Yunnan's armed police force, 25 officers have died in shootouts with armed drug traffickers during the past five years. In 2010 alone, 28 trafficking cases involved guns. The ways that people are trying to smuggle drugs into the province have also changed. Some smugglers soak cloth in water in which drugs have been dissolved and extract the drug from the cloth after they have crossed the border, Meng said. 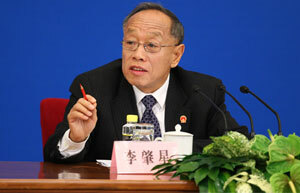 "China has been committed to tackling drugs. The road twists and turns, but the future is bright."